Habitat : Throughout india, in forests upto 1,800 m usually along river banks and also cultivated. 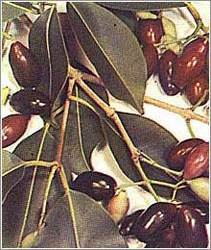 Uses : The leaves are antibacterial, and are used for strengthening the teeth and gums. The fruit and seeds are sweet, acrid, sour, tonic and cooling. They are used in diabetes, diarrhoea and ringworm. The bark is astringent, sweet sour, diuretic, digestive and anthelmintic. Leaves are used as poultices on skin diseases. Decoction of the fruit is used in case of enlargement of the spleen.